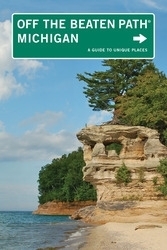 This is the essential guide to extraordinary travel in Michigan. Tired of the same old tourist traps? Take the road less traveled and uncover the hidden attractions, unique finds, and unusual locales other guidebooks just don’t offer. Off the Beaten Path features the things you’d want to see, from the best in local dining to quirky cultural tidbits. Discover a different side of the Great Lakes State. Jim DuFresne’s guidebook covers the known, The Henry Ford, to the unknown, the Toy Museum on Beaver Island. Step inside waterfalls and forts; learn a thing or two about marital harmony on the Be Good to Your Mother-in-Law Bridge in Croswell; or steer through a collection of more than 1,500 car hood ornaments at the Gilmore Classic Car Club of America Museums. The 270-pager guidebook includes maps and drawings.